Beauty | The Body Shops Drops of Youth Bouncy Sleeping Mask. 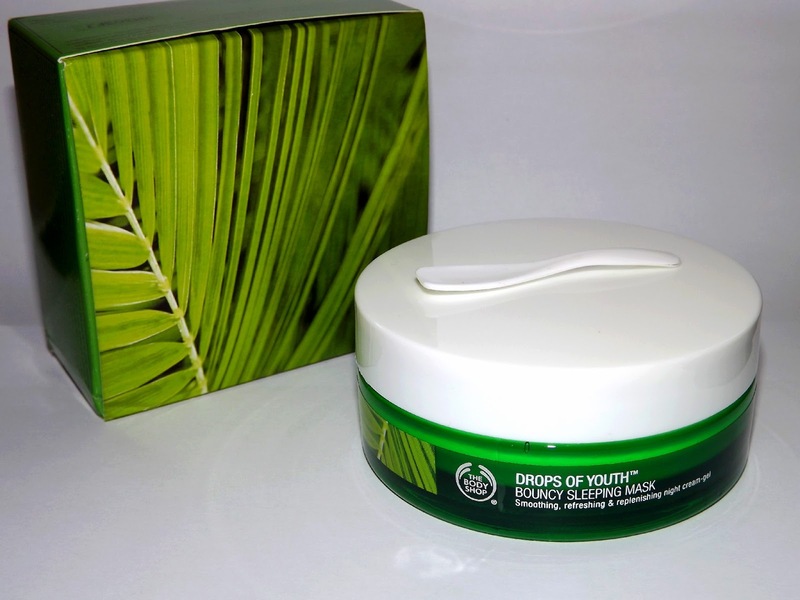 A few months ago now, I went to a blogger event at The Body Shop where I was very kindly gifted with a sample size sachet of the Drops of Youth Bouncy Sleeping Mask. I hadn't used an overnight mask before so I was really looking forward to trying it... Turns out, I loved it! And so much so, that I ended up purchasing the full size tub. The Drops of Youth Bouncy Sleeping Mask is designed to be applied just before bed and then left for 8 hours to work its moisture injecting magic. The first thing you'll notice about the Drops of Youth Bouncy Sleeping Mask is its ridiculously bouncy texture. I've never seen or felt anything like this before in my entire life! The masks texture is quite similar to silicone because it's thick and tacky, but don't let that put you off... It is a bit daunting at first, but a couple of minutes after application it smooths itself out and leaves the skin feeling much silkier, almost like you've just applied a primer. For the application process The Body Shop supply the cutest little spatula which helps in determining how much of the product you actually need on your face, and it's a lot less than you might actually think. One little spatula goes a long long way so the 90ml tub will last a ridiculously long time. I've been using the product for just over a month now and as you can see I've barely scratched the surface with it. Yay! The Drops of Youth Bouncy Sleeping Mask contains Edelweiss stem cells which targets anti aging, and even though at the ripe old age of 25 I don't necessarily need it just yet, I think it's best to start early. I ant got me no laughter lines yet, but what I can tell you is that it's made my skin feel so nourished and plumped. It's really surprising how different my face looks the next morning - It's amazing! What I've mostly been doing is applying the mask a couple of times a week, but the day after having a no makeup day just to give my skin a rest and feel the full benefits of the Drops of Youth Bouncy Sleeping Mask. I absolutely adore this product! The difference it makes to my face is sensational and I'll continue to buy & buy again. 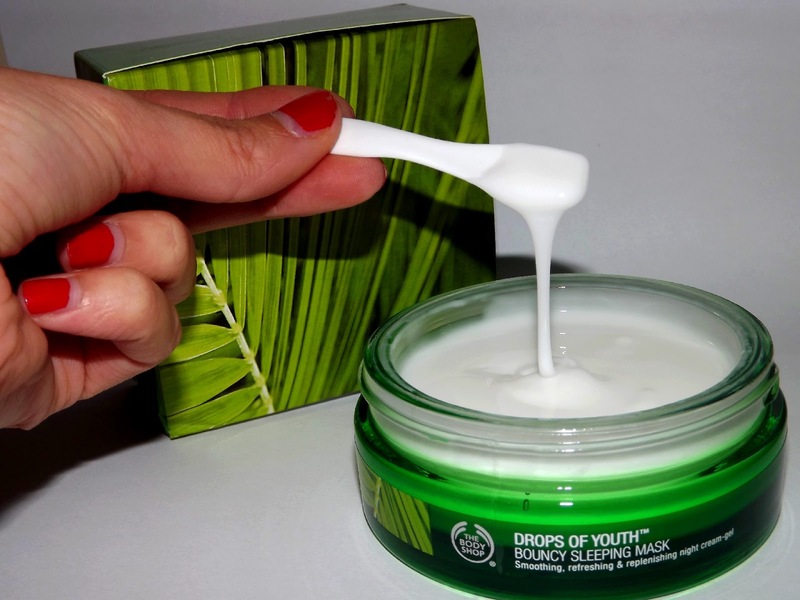 Have you tried the Drops of Youth Bouncy Sleeping Mask before? Is there anything else in the range I should be trying? Lots of love | xclaireabella. 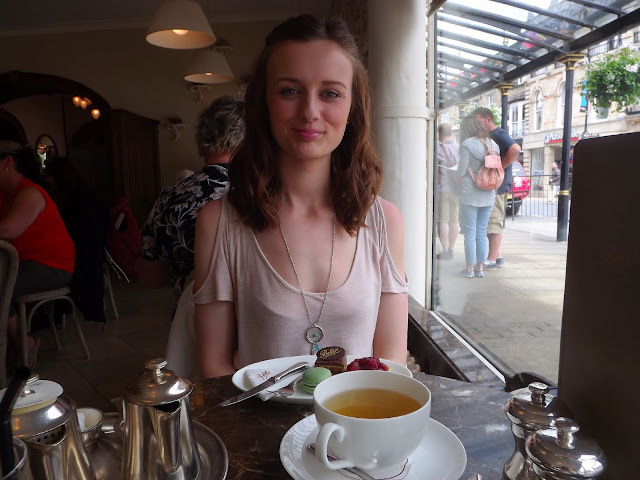 Food | Cream Tea at Bettys Tea Room, Harrogate, Yorkshire, UK. A few weeks ago, on what I'm pretty sure was the hottest day of the year, I took a trip up to Harrogate with my friend Nikki for a bit of shopping, a bit of gossiping & to visit the famous Bettys Tea Room for afternoon tea. 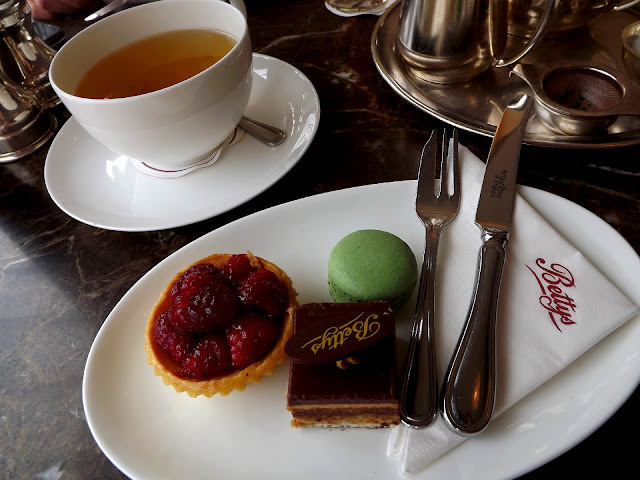 I've wanted to go to Bettys for as long as I can remember, but my foot has never stepped through the door because of how unbelievably busy it gets. The queue to get in constantly wraps around the building so it's best to get there early like we did. We popped in just before lunch and surprisingly got a table right in the window. The combination of Swiss confectionery & Yorkshire warmth (not to sound biased) is an absolute success, we received a super duper warm welcome as soon as we stepped through the gorgeously ornate doors & into The Montpellier Cafe Bar. There was an instant buzz of excitement, we knew straight away that we were going to be in for a treat! After looking through the menu & trying to suss the huge variety of teas I ended up playing it safe and ordered a pot of Peppermint Tea... Not very original I know, but sometimes too much choice can really freak a girl out. The tea came out on a super cute silver tea tray with a seperate pot of sugar cubes and a strainer. The tea was a beautiful blend & really refreshing, I unfortunately however couldn't finish it because there was just too much (and I didn't want to pee my pants) but it was really scrummy. There were two options for afternoon tea, one being the Yorkshire Cream Tea which had a selection of scones, strawberry preserve & clotted cream which sounded delicious, however what we opted for was much sweeter, the Afternoon Tea Patisserie Selection; A selection of three miniature afternoon tea cakes and patisseries. My eyes lit up when I was delivered my plate of sweetie goodness. On it was a fresh fruit tart, chocolate layer cake & a macaroon. All three items were delicious, especially the chocolate layer cake (gahhh it was amazing) it was so so rich but it was bloody lovely & surprisingly just the right size. The whole plate was just the right amount of food & with the copious amounts of tea we were drinking, we left feeling surprisingly full. 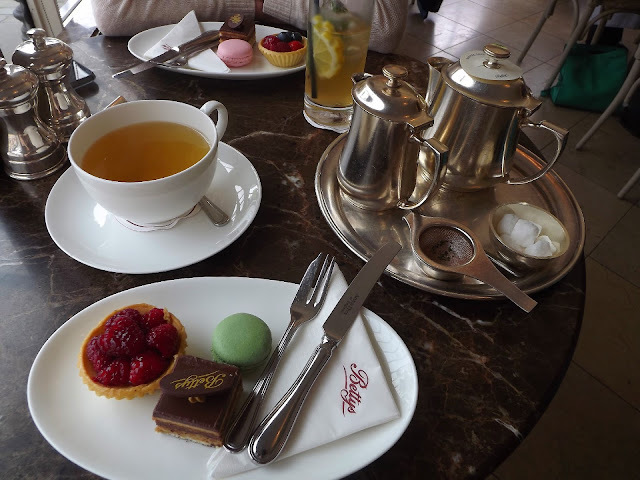 We had a wonderful day & I would 100% go back to Bettys, it was an amazing experience & really nice to just chill out and have a girlie gossip! 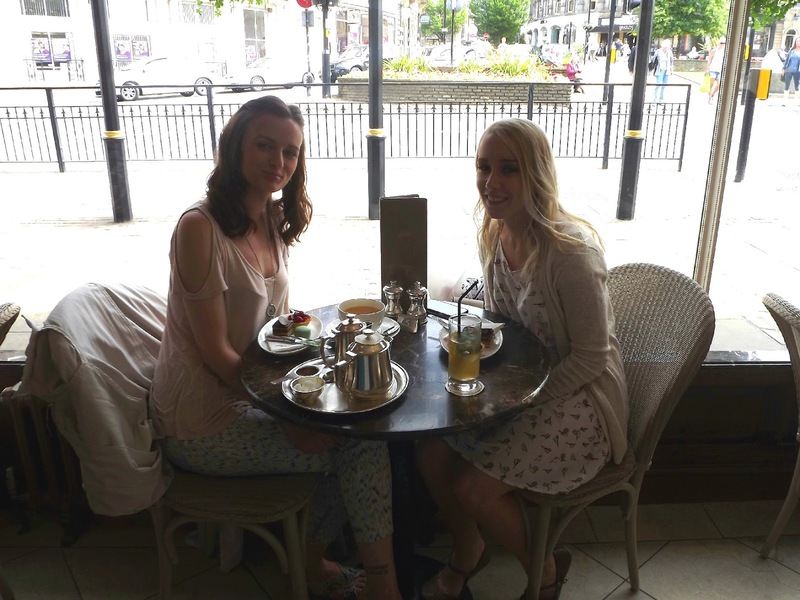 Have you been to Bettys before? Fashion | What I Wore To #TheCityGirls Event, Leeds, UK. 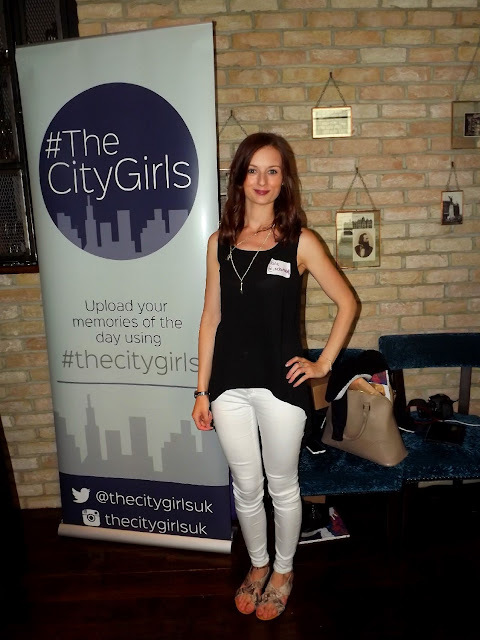 On Saturday I had the pleasure of attending #TheCityGirls event at The Liqorist in Leeds. I'll be posting more about the event next week (it was ahhmazing) but today we'll just be looking at what I wore. After the event I was actually heading off to a friends Hen Party so I needed a good transitional outfit. Something casual enough for during the day but also something slightly dressy for a night on the tiles. That's when I thought monochrome... You 100% can not go wrong with a monochrome outfit. 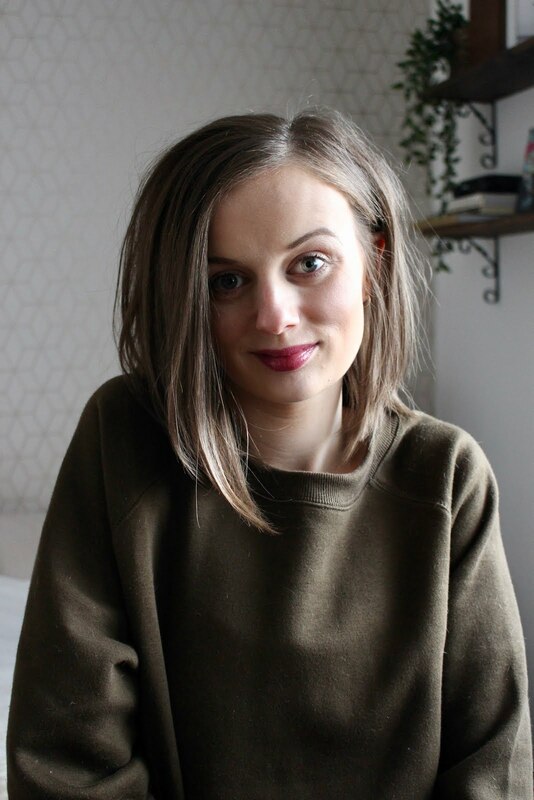 I don't think I've styled this blouse on the blog yet, but I've had it for a little while now and I've worn it loads. It's amazing because from the front it looks like an average black blouse however on the back it's a dipped hem with a coat tails style slit up the back. I love how lightweight it is too, perfect for the glorious (hoping I'm not speaking too soon) weather we've been having. I've contrasted with super bright white jeans, that if I'm honest are a teeny tiny bit too tight for me, but what the heck... I'm a slave to the fashions... I didn't eat too much at the event, lets put it that way. I've worn skinny jeans for the last hundred years & think they always look best paired with a floaty or over sized top to balance out the silhouette. Because of the beautiful weather I decided to wear open toe sandals, and I kept them flat knowing the busy day I was going to be having. If I'd have worn heels I would have been absolutely buggered by mid afternoon. Even though I work in a jewellers I don't acually wear too much jewellery but because my outfit is very minimalist I thought I needed it today. I've gone silver, picking pieces from Pandora, Charmed Ivy & an amazing ebay find! If you were at the event I'd love to see your links, it was great meeting so many new people. What do you think to todays' monochome outfit? 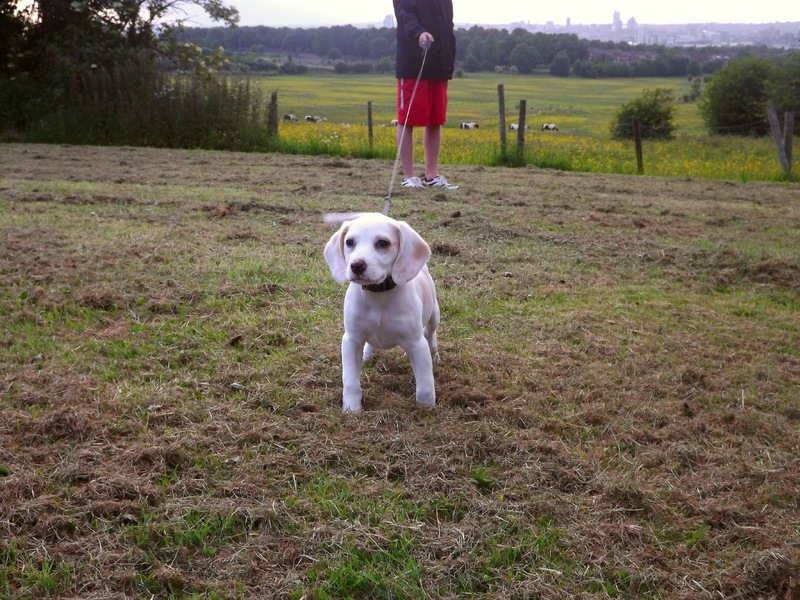 Lifestyle | Willows' First Walk. 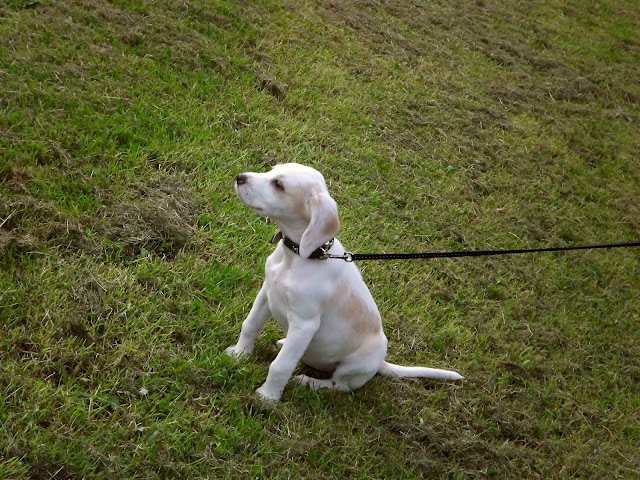 After having all of her vaccinations & being micro-chipped Willow was finally allowed to venture into that big open world. Woohoo! 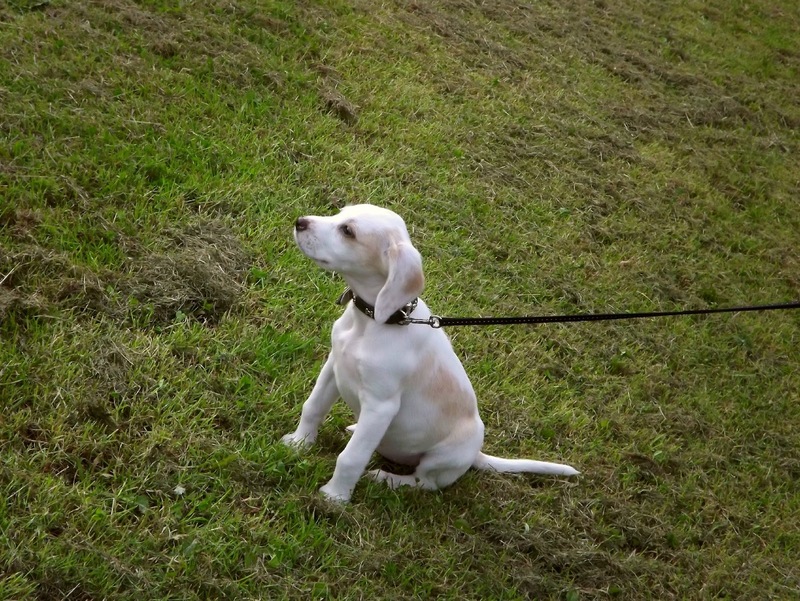 Because she's still a puppy Willow's only allowed to go on a 10-15 minute walk each day. They say for every month old your puppy is they're allowed to be out walking for 5 minutes so the older she'll get the more & more time she'll have outside. 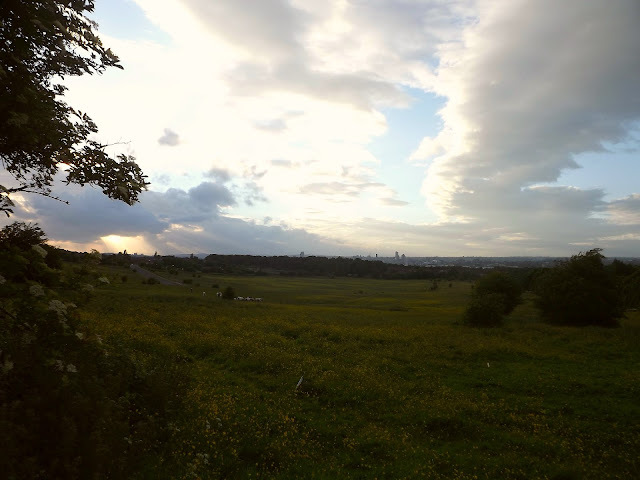 We're lucky enough, that our new house in Stourton is situated opposite a large stretch of field, so we can get straight outside & make the most of our short timescale. It's amazing because the field looks out onto Leeds, so in the foreground there's gorgeous countryside & then in the background there's the hustle & bustle of the city. It's so pretty! Willows' really enjoying getting out and about, there's so much for her to see, sniff & do - It's as if there's a constant distraction. Let's just say on a 15 minute walk, we didn't get far at all, but she enjoyed herself and enjoyed meeting all the other people & pups out there. Literally everybody stops & admires her, asking for cuddles and saying how cute she is, we're going to make so many new friends with this dog walking malarkey!